It´s the third REX THE DOG single on KOMPAKT. And finally answers everyone's justifiably high expectations. Yes! We remember! But first. let's go back a bit.... To the beginning of 2004 (already such a long time ago). "PROTOTYPE" (KOMPAKT 92) hit like a bullet and exploded like a bomb. Veiled in secrecy, REX THE DOG provoked an exciting new sound. Bafflingly overwhelming and utterly unforeseen. That shimmering blend of Glam-Techno and Euro-Disco carried only one clue. A musical signature this bombastic (aside from Justus Köhncke of course), could only be derived from the UK. With an ounce of exaggeration and a pint full of willingness to rough up our self-contented minimal techno scene, REX THE DOG went along with his master on an astounding world-wide tour of dance floor recalibration. Then, half a year later it was "FREQUENCY" (KOMPAKT 102) that brought forth nothing less than similar reactions to it's predecessor. REX THE DOG's ambitious and extravagant personality had official made him KOMPAKT's favorite family pet. Following a massive streak of remixes for many that included, THE PRODIGY, THE KNIFE, MYLO, DEPECHE MODE and RÖYSKOPP We now arrive at "MAXIMIZE" . Our detail obsessed, four legged friend returns with no restraint, and has kicked us out of the techno chair to make it their home once again. It was far too easy for us to put those digital glam-tech leggings on again! "MAXIMIZE" recalls the dog we all know and love, whereas with "SEQUENCER", we are positive all will welcome this spookier side to our furry friend. Then there's the bona-fide hit "EVERY DAY (COULD BE THE LAST DAY)"... He speaks!? He sings!? Maybe we said too much... So, dearest dog-lovers - it's true. The best things do come in threes. Dies ist die drtitte REX THE DOG Maxi auf KOMPAKT. Und sie erfüllt alle, zu recht hohen Erwartungen. Wir erinnern uns. Anfang 2004 (so lang ist das schon wieder her) erschien “PROTOTYPE“ KOMPAKT 92 und schlug ein wie eine Bombe. Sie kam mit aufregend neuem Sound um die Ecke den niemand erwarted hätte. Eine flirrende Mischung aus Glam-Techno und Euro-Disko wie sie meistens, von Justus Köhncke mal abgesehen, nur von Engländern erdacht werden kann. Mit viel Mut zur Übertreibung und dem festen Willen, die, bisweilen allzu gemütlich vor sich hin groovende Minimal-Techno Szene aufzumischen, übernahm REX THE DOG, quasi über Nacht.die Tanzflächen von Moskau bis London. Ein halbes Jahr später erschien die nachfolge Maxi “FREQUENCY“ KOMPAKT 102 die ihrem Vorgänger in nichts nachstand. 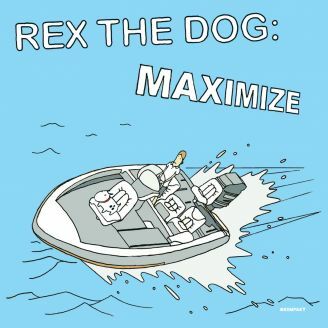 Nun liegt die dritte REX THE DOG Maxi “MAXIMIZE“ vor und ein drittes mal gelingt es dem detailbessenen Ausnahmekünstler uns vom Dub-Techno Hocker zu kicken und die digitalen Glamtech-Legings aus dem Schrank zu holen. Die drei Smashhits auf der Scheibe, im besten Sounddesign, perfekt ausproduziert , machen es unmöglich einen der Tracks besonders hervorzuheben. Also, Hundefreunde aufgepasst. Aller guten Dinge sind Drei!